At least he has the right look to be president. A year ago, Washington Gov. Jay Inslee dodged the issue of his presidential aspirations with a half-joke. Yes, Inslee said, he could imagine running for president, the same way he could "imagine replacing Russell Wilson for the Seahawks." But as silly as it sounds, it's not entirely impossible: After all, back in 1969, Inslee was the varsity quarterback for Ingraham High School in north Seattle. And the chance he'll run for president is looking even more likely: He's meeting with big-money donors, has raised more than $100,000 in his presidential PAC and has been blowing through his security-detail budget with out-of-state travel. In fact, a little over a year ago, columnist Josh Barro was wondering why, as chair of the Democratic Governor's Association, Inslee wasn't being talked about as a viable contender for president. "Because he's not a great politician," tweeted Nate Cohn, the New York Times' data guru who grew up in Washington state. Still, people thought Inslee wouldn't win when he first ran for governor either, says Washington state Rep. Marcus Riccelli (D-Spokane). "If there's one thing Jay Inslee knows how to do, it's win elections," Riccelli says. "I would not count him out of anything." So does he have a shot? Well, he has the look at least. He stands at a perfectly presidential 6-foot-3. He's got presidential hair. His jawline projects gravitas, yet compassion. He has the advantage of being the governor of Washington, a state that has a booming economy, a low unemployment rate, a thriving tech sector and a high-minimum wage. 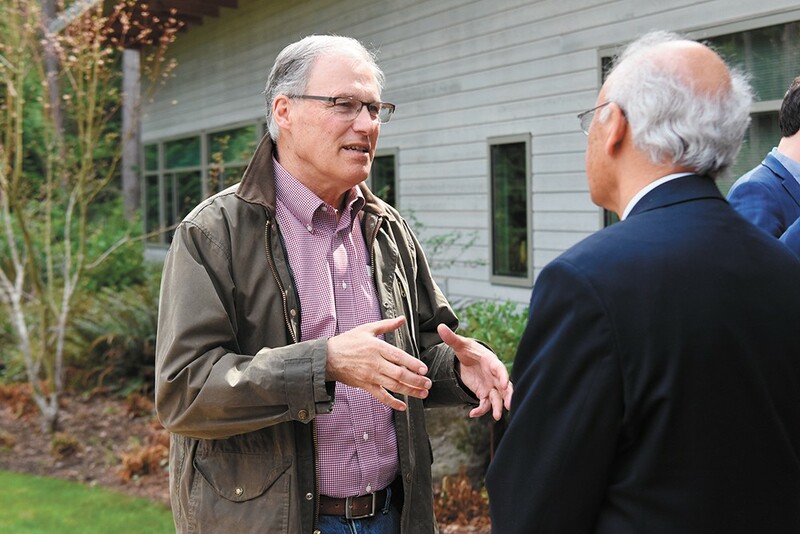 But height and hair aside, Inslee faces a few huge potential issues if he wants to win the Democratic nomination. You, a savvy Inlander reader, know who Jay Inslee is. (The governor of Washington state, it turns out.) But to even begin to compete in a field already crowded with massive crowd-drawing names like Bernie Sanders, Joe Biden and Beto O'Rourke, Inslee has to find a way to stand out. There's no #InsleeWouldaWon hashtag. There aren't any Onion articles riffing on the hard-rocking exploits of "Diamond Jay." There are very few swooning national magazine profiles or shockingly sexually explicit viral tweets about Inslee. Still, Inslee has seemed to have figured out a method to get noticed: Hit Donald Trump with a punchy phrase. "Less tweeting, more listening," Inslee told Trump during a conversation about gun violence last year. That made headlines. Not a surprise then that after Gen. Jim Mattis resigned as defense secretary last month, Inslee tweeted how it was "a predictable consequence of narcissistic incompetence." And what do you know, that very morning Inslee was being interviewed on BuzzFeed. 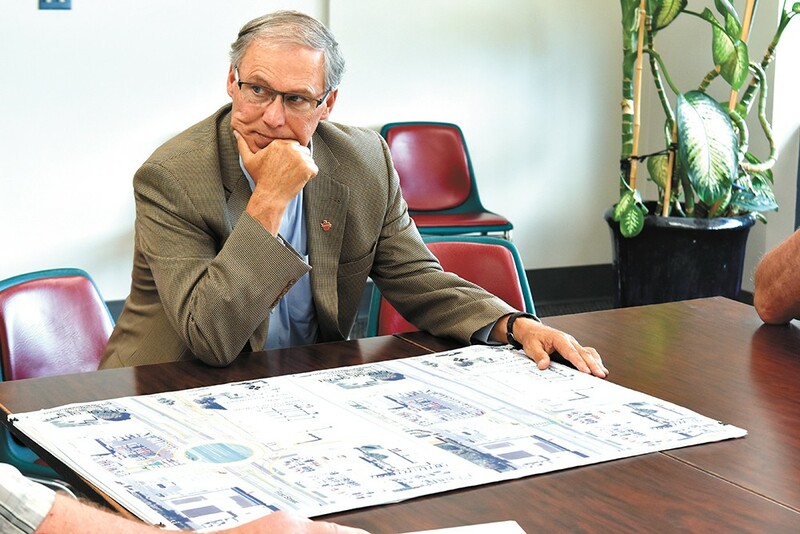 Last month, Rolling Stone interviewed Inslee, highlighting his ambition to tackle climate change. This, Rolling Stone implied, could be Inslee's best shot to distinguish himself from the rest of the Democratic horde. But here's the challenge: Inslee's asking you to believe that he'll be able to sell climate change legislation to America, when he can't even do so in liberal, forest-fire-choked Washington. His cap-and-trade bill couldn't get through the Democratic-controlled House. A Thurston County judge nixed his executive order mandating carbon cuts. Washington voters have crushed carbon tax initiative proposals not once, but twice. And to Eastern Washington environmentalists like former Center for Justice Director Rick Eichstaedt, Inslee has been "mediocre" on the environment, bending over backwards to cut certain big business polluters slack. It was Obama's Environmental Protection Agency that had to force Inslee's Ecology department, Eichstaedt says, to adopt tougher limits on cancer-causing river pollutants. On the other hand, as Riccelli notes, Inslee has had to contend with a Republican-controlled state Senate for most of his tenure. This year, he had bigger margins than he's ever hard. While he's not proposing another attempt to level a carbon tax, he has presented an ambitious climate change plan this year, including moving the state to eliminate all fossil fuels from its power grid by 2045. By the time Democratic primary season starts in earnest this summer, Inslee's resume may look a lot more impressive. With the field getting a little crowded, Jay Inslee has work to do to stand out as a candidate. Sick of snooty Washingtonians cooing about how progressive their state is? Point out that Washington state has the most regressive tax code in the country. You see, when you saddle your poorest residents with a sales tax instead of taxing income, folks who have to shell out a big percentage of their paycheck to survive every week suffer. But where some Democratic politicians, like former Senate Majority Leader Lisa Brown, passionately argued the state needed to adopt a more equitable income tax, Inslee has said he doesn't support an income tax. And yet, this month, Inslee is introducing a new budget that calls for a big tax hike on the wealthy, including a new capital gains tax and a shift to make the real estate excise tax more progressive. Even if it doesn't pass — or get struck down as illegal under Washington's state's constitution — the attempt is something Inslee could point to on the campaign trail. Washington's booming business climate is one of Inslee's greatest assets — for the general election. But Bernie Sanders and Sen. Elizabeth Warren have both been bashing Amazon for its labor practices. But Inslee? When Trump was slamming Amazon, Inslee rode to the defense of the trillion-dollar corporation helmed by the richest man in modern history. "A big part of Washington's economic success is due to Amazon's 40,000+ employees in our state and the small businesses they empower to sell to the world," Inslee tweeted. And that's not even including Inslee championing Boeing's record $8.7 billion in tax incentives over 16 years — among the biggest corporate tax breaks in U.S. history. Still, Inslee can point to his more left-leaning record as a congressman before he was a governor: He voted against the economic bailout of 2008 and opposed the wars in Iraq and Libya. And his attorney general just won a massive lawsuit against the recent corporate villains of the moment, Google and Facebook, for campaign finance violations. In 2014, Washington state had the worst property-crime rate in the nation. It's still in the top five. And it's not like Jay Inslee doesn't know what's wrong. Inslee's own Justice Reinvestment Task Force fingered the problem in 2015: Washington is the only state in the nation that generally doesn't supervise its property-crime felons after they get out of prison. But since then, Inslee has publicly showed little interest in trying to fix the problem, even as Spokane's local representatives have tried to cobble together solutions. Forget competing with Donald Trump over who's "tougher on crime?" Can Inslee even claim that he's been "smart on crime?" On the other hand, it's violent crime, not bike wheels being stolen outside of River Park Square, that tend to star in presidential races. When challenger Bill Bryant barely hit the governor on the state's dismal property crime record in 2016, why would anyone in 2020? Washington state has among the highest rates of unsheltered homelessness in the country. A recent report by the Office of the Family and Children's Ombudsman found the state's foster care system was dismal, particularly for children of color. When Mental Health America ranked the states on how well their mental health services were meeting the states' needs, Washington state came in 39th. Inslee's entire tenure has been dogged by one embarrassing headline about Western State Hospital after another: patient escapes, fire hazards, the loss of $53 million in federal funding because of violations. Just this year a nurse got part of her ear bitten off. If this is supposed to be evidence of how well a progressive state cares for the needy, it's not a particularly pretty one. However, in December, Inslee rolled out a plan for a $675 million bill overhauling the state's mental health system, including plans for seven new facilities and 500 new mental health beds statewide. And when it comes to health care, Rep. Marcus Riccelli thinks that state Democrats have a chance to pass a "public option" bill, letting a government-run insurance plan compete with private companies, ideally driving down premiums. And that might catch primary voters' attention. The good news for Inslee: There is a political party composed predominantly of white men. The bad news: It ain't the Democratic Party. Increasingly, the Democratic coalition has relied on the votes of women and minorities, and Jay Inslee very clearly isn't either one of them. "Put a white man in charge, yet again" might not be the hope-and-change slogan Democrats are craving right now. Still, early polls have other white bros like Bernie, Biden and Beto off to early leads. Rep. Marcus Riccelli argues that what Democrats want isn't about identity so much as who has the best message and resume to win. What they want is simple, Riccelli says. The original print version of this article was headlined "The Problems with "Inslee 2020""